Very few of the people I’ve known Growin’ Up in Maine are aware that I spent one year as a lineman building cable television lines when catv was in its infancy. Forget the title here. I’ve never been incarcerated, and although it was hard labor, it was a lot of fun, too. My work since has been more sedentary, and as a child I climbed more trees than I can count, so the work was a natural. 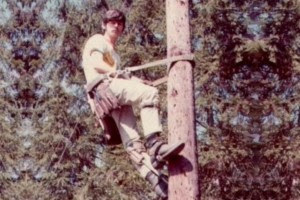 The photo of me here illustrates the ease with which I climbed, drilled, and put in the hardware to string steel support lines, and later the coaxial cable. I worked the ground for two months supporting a team of lineman, and watched what they did like a hawk while learning to duck bolts and miscellaneous other falling objects. The linemen made twice my salary and one day I was “caught” by the foreman at breaktime climbing a pole like a monkey using borrowed equipment. I started as a lineman the next day at double my previous pay. As teenagers and spending summers like Huckleberry Finn and Tom Sawyer, the woods were as important to my circle of friends as the old swimming hole Down Back. In winter, we invented small town versions of extreme sports, and trees provided great opportunities with a little imagination. Picture climbing a 50 foot pine tree covered in snow, and then climbing out on a limb near the top. Next, we let loose and slid down the outer boughs of the tree in an avalanche of snow for one heck of a thrill ride. The triangular shape of the pine tree meant the limbs and snow slowed down the fall, and with 4 to 6 feet of snow on the ground the landing was fairly soft. Our parents were unaware of most of the reckless behavior, so I must apologize now to Mom if she reads this one because it took more than 40 years to confess. There’s more. Stay tuned.